This paper explores the Jewish community of Didsbury, a middle-class suburb five miles south of the city of Manchester, during the period 1891-1914. Socioeconomic comparisons were made between the community and the northern sector of the city’s Jewry researched by Williams (1976). Analyses of the Trade Directories and Census Enumerators' Books for Didsbury, following mostly Armstrong’s classification (Drake and Finnegan, 1994), confirmed the hypothesis that ‘separation of classes affected the Manchester Jewish minority as much as the general population’. Besides the expected North-South class divide, further divisions within the Didsbury community were found between the Sephardi and Ashkenazi Jews in support of Price’s (1984) findings. This paper is based on my 1996 research project for the Open University course DA301, Family and Community History. I created this particular topic for my final project report because firstly, I wanted to research my own locality of Didsbury, where I have lived for many years. Secondly, I wanted to address the surprising lack of published research on the Didsbury Jewry - very surprising because Didsbury has long been known for its flourishing Jewish community, to the extent that it became known as “Yidsbury” and Palatine Road (a major road running through it) as “Palestine Road”. The Didsbury Jewry, I feel, deserves far more documentation than has so far received because of the rich and valued cultural diversity it has brought to Didsbury mainstream society. 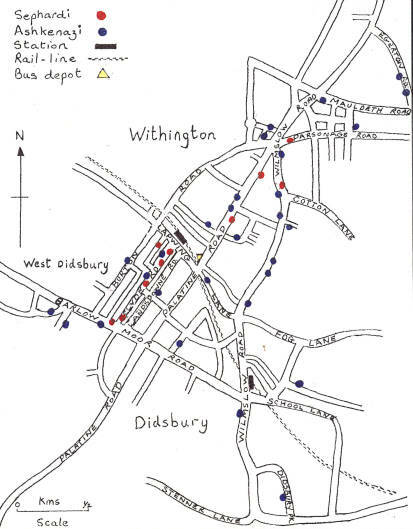 For the purpose of this study Didsbury will include the neighbouring suburb of Withington since many members of its Jewish community lived on major route ways of Palatine Road and Wilmslow Road, which ran through both areas. Besides the difficulty in determining the boundary line on these roads, it would be frustrating to exclude certain members of historical interest merely because they lived just over the Didsbury border. Following primarily the hypotheses testing strategy, the aim of this study is to identify, with reference to the work of other researchers, socio-economic divisions between the Manchester Jewish communities. 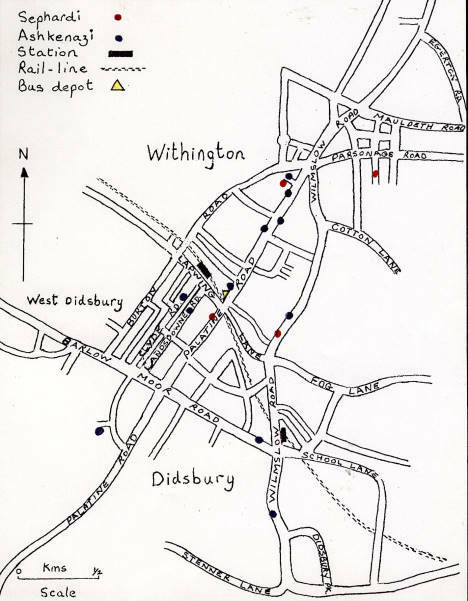 By focusing on the Didsbury Jewish community during the period 1891-1914, divisions were expected to be found between the community and the northern sector of the city’s Jewry of which Williams (1976) focused his research. a) affluent Jews moved southward away from the city’s Jewish enclave, towards and into the middle-class suburb of Didsbury. b) further social divisions within the Didsbury Jewish community existed between the Sephardi and Ashkenazi Jews. affluent Didsbury Jewish figures, which created further social divisions between the community. Due to time factors and word limitations for this study, no attempt was made to distinguish between orthodox and non-orthodox Jews. Class divisions amongst Jewish communities are documented by Williams (1976), Englander (1994), Waterman (Pryce, 1994) and Price (1984). Although the time scale of the work of some of these researchers is different, they have nevertheless, conducted critical research in areas which is relevant to my work. Reference to Williams’ book The Making of Manchester Jewry: 1740-1875 (1976) provided valuable statistical data for making quantitative socio-economic comparisons, which will be discussed in Section 3. It was also an excellent source base for information on the origins of the Manchester Jewish community. It shows that the greatest suburbia movement (beginning around 1815) was northward towards Broughton with a small southward movement to areas such as Chorlton-on-Medlock and Rusholme. This is significant to my research since trade directory and census data show that numerous Didsbury Jewish residents began their southward step-migration through these areas. Gustav Behrens (a wealthy Jewish merchant), for example, lived in Plymouth Grove, Chorlton-on-Medlock in 1881-86 before moving to Didsbury. Elizabeth Gaskell (novelist) also lived in Plymouth Grove until her death in 1865 and assimilation into mainstream middle-class society is evident amongst her Jewish neighbours who socialised at her house - it was a ‘social centre’ for ‘Jewish as well as non-Jewish’ (Williams, 1976, p 169). Waterman and Englander’s research demonstrates similar patterns of Jewish suburbia movement from the central areas of other cities. Waterman’s research of Jewish settlement in Dublin found that this began with clustered segregation and gradually ‘prosperous families filtered out into the surrounding suburbs ... which themselves then became the focus of Jewish institutions and began to attract later immigrants’ (Pryce, 1994, p.166). As my findings will show, this mirrors the development of the Didsbury Jewish community which began around 1871 with only four Jewish households. Englander’s study of East London Jews illustrates similar class divisions which he identified from the location of synagogal provision. 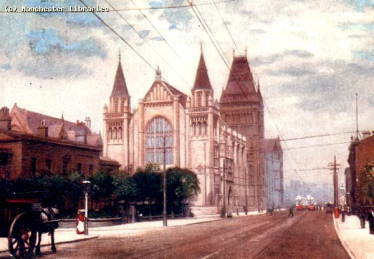 Three new synagogues were established in the West End as a result of ‘the westward march of the wealthy’ (1994, p. 184). Similarly, new synagogues were founded in South Manchester from 1872 to cater for the growing south-suburbia Jewish middle-classes. By illustration of Mrs Brewer’s article (1892), Englander also points to the predominance of certain working-class ‘immigrant’ trades such as tailoring and cap making within the East End Jewry. Such trades also dominated the Manchester’s Jewry and contrasts with the Didsbury Jewish workers who were predominantly wealthy shipping merchants. A major question raised in my research was what brought the Jews to Didsbury? Although there were numerous influential factors, such as cleaner air and improved transport facilities, educational opportunities were particularly likely to have drawn them to the area considering it was distinctly academic. Williams’ research shows that the Jewish community placed stress on education as ‘an instrument of social change’ (1976, p.89), particularly for social mobility into the professions. ‘The movement of Jews into the professions had begun when Jacob Nathan sent his son, Lewis Henry to Manchester Grammar School ... and on to London to train as a surgeon’ (Williams, 1976, p.123). This project reveals similar aspirations of numerous Didsbury Jewish parents for their offspring. Elias Canetti, Jewish author of The Tongue Set Free (1988), for instance, lived in Didsbury as a child and recalls his father’s response to his wish to become a doctor, ‘You don’t have to become a businessman like me and the uncles. You will go to the university and you will be what you want most’ (Canetti, 1988, p.42). To the anxious leaders of Anglo-Jewry the degraded condition and rumbustious life styles of the Jewish populace were perceived as an embarrassment, and as major obstacles to their integration into British life (1994, p.185). Williams echoes this argument stating that the earliest Jewish settlers to South Manchester moved southwards ‘to distance themselves from their social inferiors’ (1976, p. 313). The issue of snobbery is, however, difficult to establish within this study that is based primarily on quantitative data. To compare the socio-economic divisions between the North and South Manchester Jewish communities, Armstrong (Drake and Finnegan, 1994) and Rau’s (1984) class indicators have been used which will be discussed under Section 3. 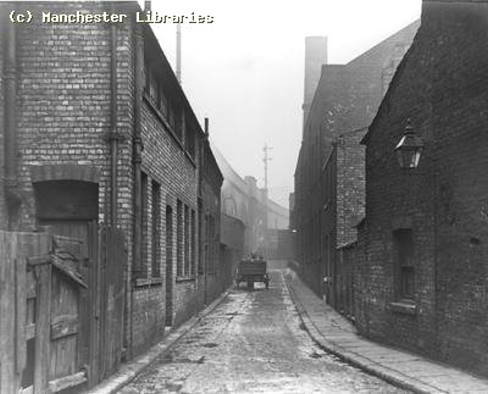 The main primary sources used were the Manchester Trade Directories. Working back from 1891 to 1869 at five yearly intervals, I extracted the names, addresses (including business address) and occupations of Jewish residents. The objective was to analyse Jewish migratory patterns and to classify the Didsbury residents’ socioeconomic status by occupation and type of residence occupied. 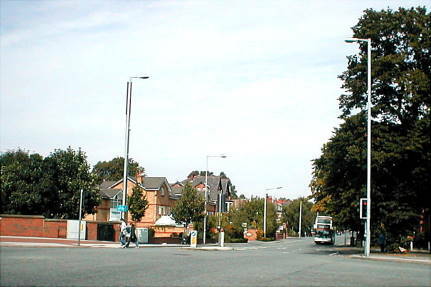 The number of Jewish residents living in Didsbury at each time interval determined that the community began to become established during the late 1880s. Local amenities such as schools, transport and recreational facilities were also recorded. My search, however, for Jewish facilities proved less fruitful. 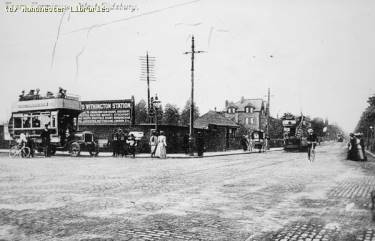 Apart from a kosher butcher that opened in 1914, no synagogues or registered Jewish institutions appeared to have been established in the Didsbury area during this time. A major limitation with the directories was that many of the residents were listed under the private resident section of which occupations were not listed. Many occupations therefore remain unidentified within this study. Another limitation was in my lack of familiarity with untypical Jewish surnames which presented problems in identifying them all. I therefore supplemented my data with the trade directory data of 1891-1914 complied by Price (1984). Although Price also encountered difficulties in tracing occupations, her data was invaluable as she identified additional Jewish names that I had overlooked, and differentiated between those which were of Ashkenazi and Sephardi origin. Several methods were adopted to test the middle-class credentials of the Didsbury Jewish community. By comparing them with the northern sector of the city’s Jewry, I consulted the statistical data from Williams (1976). From the Census Enumerators' Books for Manchester and Salford, he extracted individuals who belonged to the Jewish community of 1841-71. I focused on his data for 1871 since it was the closest year to my study period. A particularly useful set of data he provides from them is the occupations of 1,170 Jewish workers (1976, pp.358-360). I then used Armstrong’s classification (Drake and Finnegan, 1994, pp.48-49) to compare all known occupations of both communities. Because the occupations of many Didsbury Jewish residents were unknown to me, and Armstrong’s classification did not always match those that were, I turned to the Census Enumerators' Books for 1891 for additional class indicators, such as whether the householders were ‘employed’ or ‘employers’, and to fill in missing occupations. The keeping of servants was one middle-class indicator which Rau discusses in her article ‘Who Chose Chalcots?’ (Offprints 1, Article 2) and significant since the Census Enumerators' Books showed that Jewish householders kept an average of three servants. Another middle-class indicator identified by Rau was out-migration from the central areas of the city. The children’s place and date of birth were therefore recorded as indicators of the length of time the family had lived in the area, their previous area of residence and whether their move involved step migration to more desirable areas. The householders’ birthplace indicated whether they had migrated directly from another country or town. The names of male children were also cross-checked against the Manchester Grammar School (1965) register of old Mancunians (see below for objective). Had the Census Enumerators' Books been accessible up to 1914, as were the directories, they would have been the most fruitful source because of their standardisation into categories which enables comparisons of statistical data to be made. Their limitations, however, is that the handwriting is not always legible and some occupants may not have been home on census night. The possibility of illiteracy or untruthfulness was also taken into consideration. In order to gain insight into the social position of members of the community and of any possible assimilation into mainstream society, I consulted several primary literary sources in search of familiar names. Obituaries (from newspaper cuttings) of prominent Didsbury Jewish figures reported any outstanding achievements made by the deceased and active contributions made towards the wider community. The autobiography of Elias Canetti, The Tongue Set Free (1988), provided insight into the author’s childhood years as a member of the Didsbury Jewish community and referred to prominent Jewish figures with whom his family was connected. A Biographical Register of Old Mancunians 1888-1951 (1965) was consulted for the information it provides on former Manchester Grammar School pupils and because of the school’s long-standing tradition in attracting Jewish pupils. Identification of registered Didsbury Jewish pupils was taken as supportive evidence of their assimilation into mainstream society. To gain deeper insight into the community, an interview was conducted with a Jewish husband and wife (Mr and Mrs 'A') whose parents lived in the Didsbury area in 1914-15. Since I had a specific set of questions in mind to test the hypotheses and to fill in gaps, and was also restricted by time limitations, I chose to conduct a structured interview with pre-set, open-ended questions. To ensure the anonymity of my interviewees, I used pseudonyms throughout. The real names of other people have only been used when cited from public and published sources. Numerous field studies of the area were also undertaken, with the aid of ordinance survey maps and lists of relevant addresses taken from the Census Enumerators' Books. These included examination of surviving houses for class identification, and examination of the local Jewish burial ground (situated in Southern Cemetery) for any relevant evidence. Because of the workload involved with such a large collection of data, this was input into a database (see Table 1 sample) which proved to be a valuable aid in analysing the community’s southward suburbia movement. It also enabled me to isolate the Ashkenazi and Sephardi Jews and residents of individual suburbs and streets at various time intervals. Shipping merchant S. Arditti Bros. Merchant Beatty, Altgelt & Co. The pattern of out-migration from the central areas of the city southbound is significant in my findings, as it was in Rau’s (1984) and Waterman’s (Pryce, 1994), in that the movement was made by the middle-class Jews. Migration moved southwards through Chorlton-on-Medlock, Rusholme and Fallowfield towards and into the desirable suburb of Didsbury. Seigmund Oppenheim, one of the first Ashkenazi Jews to settle in South Manchester around 1873 also followed this southward pattern of out-migration. Arriving from Hamburg he resided in Lytham as well as his town house in Oxford Street, Rusholme and by 1911 had moved to the 'Parkfield' residence on Parkfield Road in Didsbury. As Table 2 shows there were only four Jewish households in the Didsbury area in 1871 which, by 1914, had increased to 103. Observation of Victorian houses shows that those in Didsbury were the most prestigious compared to those in the neighbouring suburbs from which numerous Jews had moved. The Census Enumerators' Books for 1891 show that the majority of Didsbury Jews lived in large villas or palatial mansions set in their own grounds and kept an average of three servants. In sharp contrast, rows of terraced houses, situated in densely populated areas, dominated the northern sector of the city’s Jewry. 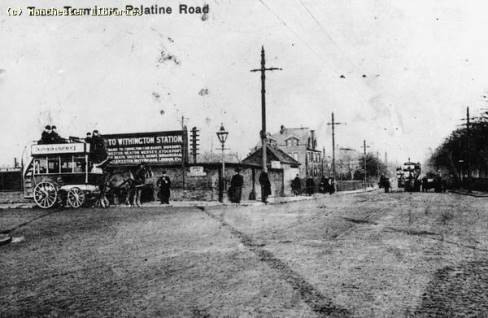 In 1871 over one third of its occupants lived in the notorious ghetto area of Red Bank, Cheetham Hill. 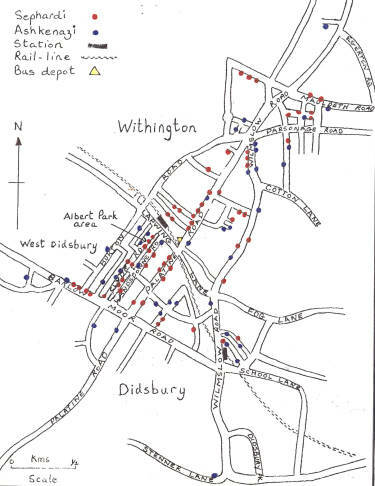 The directories show a marked improvement in transport facilities in Didsbury with the opening in the early 1880s of railway lines and horse-bus services (with electric trams from 1902) running from Didsbury to the city centre. This was likely to have influenced Jewish settlement in the area as most Jewish residents worked in or near the city centre. As the map in Appendix 4 shows, a large proportion of Jewish settlement was in the Albert Park area which was a short walking distance to the Withington & Albert Park Train Station on Lapwing Lane and the horse-bus terminus on Palatine Road, West Didsbury. Educational opportunities in particular appear to have drawn Jewish families to Didsbury. The directories list a wealth of educational establishments in the area and surrounding areas, and Mr and Mrs 'A' stated (1996) that many local Jewish children attended preparatory schools for entrance into the local grammar schools. Mr 'A', himself, attended the highly academic and prestigious Manchester Grammar School and his wife attended the equivalent Withington Girls’ School. A Biographical register of Old Mancunians 1888-1951 confirms that numerous Jewish boys from Didsbury gained entry into the Manchester Grammar School. Ephraim Ascoli, a Sephardi shipping merchant of Wilmslow Road, for example, sent his four sons to the school during the years 1894-1906. His second eldest son, Francis, became the managing director of Dunlop Plantations Ltd. (MGS, 1965). 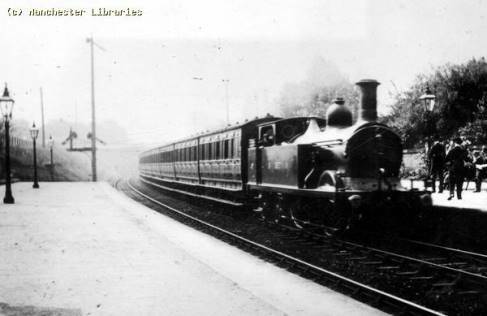 Some Manchester Grammar School pupils, such as Leonard Behrens (son of Gustav) and Louis Rosenberg moved on to Manchester University (or Owens College as it was known up to 1903) which was a short tram-ride from Didsbury. This class indicator contrasts sharply with the education of the northern sector of the city. By the turn of the century The Jews School in Derby Street had a child population of 2,000 (Williams, 1988, p.63). Unlike the non-Jewish preparatory schools in Didsbury that placed emphasis on academic attainment, The Jews School ‘reflected working-class needs’ (Williams, 1976, p. 330). Girls were encouraged to develop domestic skills and the boys were prepared for apprenticeship schemes. In contrast to the occupations found in Williams’ research, of which 75% were working-class (Class 111 or IV) ‘immigrant’ trades (33% being tailors), the occupations and lifestyles of the Didsbury Jews indicate that 36% belonged to Class 1, 56% to Class 11 and only 8% to Class 111 of Armstrong’s classification. Only 5% of the Jews in William’s study belonged to Class 1 and 8% to Class 11; as little as 4% kept servants and 33% lived in Cheetham Hill’s ghetto area. There is also a marked difference between the occupations of the Didsbury Jewish groups. The vast majority of Sephardim were cotton shipping merchants whereas a diversity of occupations, including professions, is evident amongst the Ashkenazim (see Table 3). Although I found no professional status amongst the Didsbury Jews from the directory and census data in 1891, by 1914 there were two physicians, one surgeon, one solicitor, one barrister and two engineers, all of whom were Ashkenazi Jews. Kirsten Beach has confirmed that the one solicitor cited, Frederick Oppenheim, practiced at the law firm Vaudrey, Oppenheim and Mellor on Oxford Street (Slater’s Directories 1903 and 1911) and it seems his father, Siegmund, was also connected to the firm as Justice of the Peace. To the Ashkenazim, it seems the security of professional status would have held more value over business prosperity since it cannot be taken from them through persecution from which their ancestors had previously fled. For those unable to afford the educational qualifications leading to a professional career, various businesses were established besides merchants. Mr 'A’s' father, for instance, built a successful retailing chain of men’s-wear retailers from 1905 which grew to nearly thirty branches nationwide. 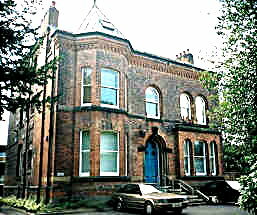 Divisions between the Didsbury Sephardi and Ashkenazi Jews are most evident in the separate synagogal provision in South Manchester. The Withington Congregation of Spanish and Portuguese Jews (est. 1904) on Mauldeth Road catered for the Sephardi congregation whilst the South Manchester Synagogue (est. 1872) which moved to Wilbraham Road in 1913 from All Saints, catered for the Ashkenazim. Similar segregation patterns were also found in the Jewish cemetery. The Sephardi graves are located at the back of the graveyard whereas the Ashkenazi graves are close to the entrance gates. Data on residential patterns supports Price’s finding (1984) that the Sephardim clustered in the prestigious Palatine Road. This was particularly evident during the years 1910-1914 when an influx of Sephardim settled there. Solomon Arditti, a maternal uncle of Elias Canetti, for instance, moved to ‘The Rossett’ at number 123 during this time where young Canetti lived with him for a short period. House sale transactions were also frequently made between the same group of Jews. Directory data shows that Arditti sold his house at 124 Barlow Moor Road to David Manashee and bought ‘The Rossett’ mansion from Joseph Smouha - all three being Sephardi Jews. Likewise, Ernest Horkheimer sold his ‘Holly Royd’ mansion at 30 Palatine Rd between 1891-95 to Gustav Behrens - both were Ashkenazi Jews. Mr and Mrs 'A' stressed that although they are themselves of a ‘mixed marriage’ (Mr 'A' an Ashkenazi and Mrs 'A' a Sephardi), intermarriage was unusual during their parents’ generation and social divisions between the two groups was marked. The home of Gustav Behrens from 1894 -1944, one of the community's wealthiest Ashkenazi shipping merchants. 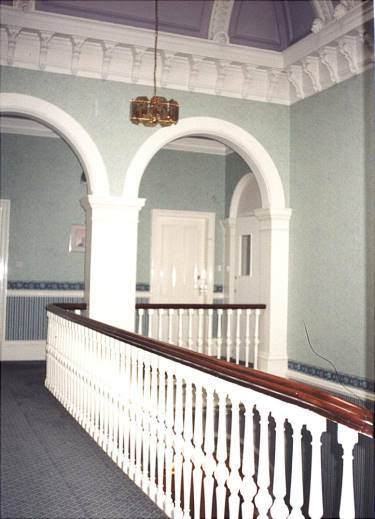 Now (1996) owned by Manchester University, functioning as a conference centre, given to the university in memory of Gustav and his wife, Fanny. Once the home of Elias Canetti's uncle, Solomon Arditti, a wealthy Sephardi shipping merchant. Canetti lived here for a short time in 1912 after the death of his father, which he describes in his book The Tongue Set Free (1988). Assimilation into mainstream middle-class society has shown to be most prominent amongst the affluent Ashkenazi members of the community. Crition Gradisky, for instance, represented Didsbury Ward in the City Council (Obituary), Israel Sieff, co-founder of Marks and Spencer, donated £5,000 to the Manchester Grammar School (Graham and Phythian, 1965, p.86) and Gustav Behrens was chairman of the Halle Concert’s Society and director of the Chamber of Commerce (Obituary). Siegmund Oppenheim also participated on quite a high level in the local community as a Vice-Consul and Justice of the Peace, Magistrate. The fact that the community’s children attended non-Jewish schools is likely to have promoted their assimilation into mainstream society, as would their upward mobility into the professions. Mr and Mrs 'A', however, recall that despite their mainstream education and friendships with non-Jewish school-peers, their parents rarely socialised outside the Jewish circle. Most of their recreational time was spent involved with charity work, literary and dramatic societies and concerts, particularly for the interest of the Jewish community’s youngsters. This study has found, through analysis of various class indicators (such as occupations, education and servant-keeping), significant socio-economic divisions between the Manchester Jewish communities of Didsbury and the northern sector of the city’s Jewry. Divisions were also found between the Didsbury Sephardi and Ashkenazi Jews. Although there were many wealthy Ashkenazim, it was the Sephardim that held the reputation associated with wealth and elitism. Yet, unlike some prominent Ashkenazim who assimilated into mainstream middle-class society, the Sephardim were more inclined to ‘keep themselves to themselves’ as is evident in their residential clustering patterns and shared occupations as shipping merchants. This study, then, bares out the wider comparative findings of other researchers in confirming the hypotheses that ‘separation of classes affected the Manchester Jewish minority as much as the general population’. To close on a personal note, a particularly rewarding aspect of this project has been the ‘hands on’ experience of using primary sources such as Census Enumerators' Books and interviewing surviving relatives. The excitement of tracing missing links from such sources has made this study a most enjoyable pursuit. Brewer, Mrs (1892) 'The Jewish Colony in London - First Paper' in DA301. Canetti, E. (1988) The Tongue Set Free, London, Pan Books Ltd.
Drake, M. and Finnegan, R. (eds.) (1994) Sources and Methods for Family and Community Historians: A Handbook, Cambridge, Cambridge University Press in association with The Open University. Englander, D. (1994) `Jewish East London, 1850-1950', in Pryce, W.T.R. (ed.) From family history to community history, Cambridge, Cambridge University Press in association with The Open University. Graham, J.A. and Phythian, B.A. (1965) The Manchester Grammar School -1515-1965, Manchester University Press. 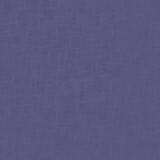 Price, S.L. (1984) Unpublished dissertation for Honours degree of BA - The Rise of the Manchester Jewish Suburbia: a study of intra-urban migration, Department of Geography University of Nottingham. Pryce, W.T.R. (ed.) (1994) Volume 2, From Family History to Community History, Cambridge, Cambridge University Press in association with The Open University. Rau, D. (1984) `Who chose Chalcots? Aspects of family and social structure in 1851', in DA301 Offprints Booklet 1, The Open University. Williams, B. (1976) The making of Manchester Jewry 1740-1875, Manchester, Manchester University Press. Williams, B. (1988) Manchester Jewry - A Pictorial History 1788-1988, Manchester, Archive Publications. Census Enumerators' Books, 1891, for Didsbury and Withington, Manchester Central Library (Local Studies Unit). Manchester Trade Directories, 1869-1914, of Fallowfield, Withington and Didsbury, Manchester Central Library (Local Studies Unit). Manchester Grammar School, (1965) A Biographical register of Old Mancunians 1888-1951, Manchester, H. Rawson & Co. Ltd.
Manchester Local Image Collection, Manchester Library & Information Service, Manchester Central Library. Obituaries, Manchester Newspaper Cuttings, Manchester Central Library (Local Studies Unit). Mr and Mrs 'A' (second generation Jewish immigrants, Director of men’s retail outfitters). Interview not recorded. Interviewed in Manchester by Julia Maine (1996). Beach, Kirsten Heemskerk, Netherlands (for the Oppenheim/Cassell/Thompson family). All correspondence via email (2005). Due to the time constraints and word limit of this project it was impossible to include all class indicators. One area that was particularly frustrating to exclude was the social and cultural aspects of the Manchester Jewish communities since culture is as much a class indicator as occupations, education and servant-keeping. Throughout my research I encountered much evidence of the Didsbury Jewish community's active interests in classical music, amateur dramatics, literary and philosophic debating societies. It would have been particularly interesting to have explored the extent to which such interests differed between the Didsbury Sephardi and Ashkenazi Jews and between the northern sector of the city’s Jewry. Considering the qualitative nature of such an area, I feel that oral interviews would be the most valuable primary source to pursue, though a later period whereby a greater number of surviving members of the community would be accessible for interviews. Conducting this research in 1996 as part of my BA (Hons) degree was prior to my internet access days. Locating, accessing, collating and analysing the data manually was therefore extremely time consuming, as well as challenging, particularly as I am non-Jewish and had much to learn about the culture. However, I found the project the most rewarding and enjoyable aspect of my degree ... to the point of revisiting it nine years on and continuing to update it over the years. Information technology has advanced significantly since 1996. We are now able to access census returns and national indexes online, which should hopefully enable me to fill in many missing links. This website also enables me to give this paper an online presence, with further opportunities for expansion should any visitors be kind enough to contact me with additional information. Thus far the response has been very encouraging and I warmly thank all who have contacted me with valuable contributions. Bill Williams (author of The Making of Manchester Jewry) for his advice and guidance. Professor Ruth Finnegan (Open University) for constructive, positive feedback on this paper. Manchester Archives & Local Studies (Central Library) for adding this paper to library stock, linking it here, and for permission to use a selection of images from its Local Image Collection. Neil Roland for sharing his insights into the Didsbury Jewish community, as it is now, which he describes in his debut novel Taken For A Ride. Kirsten Beach (Heemskerk, Netherlands) for responding to this paper with interesting insight into her husband's ancestors, the Oppenheims, for which I have created the Oppenheim Family Research webpage for her to record her findings. Feedback would be most welcome. I would be delighted to add any relevant information (photographs especially welcome) that anyone may be kind enough to offer, consider any suggestions and correct any possible errors pointed out to me. I will, of course, acknowledge any contributions should you wish your name to be published here. Thank you for visiting and please drop by again as the site is regularly updated.